Go zero-waste with an incredibly simple solution – the Backyard Digester. And it's been a simple and revolutionary experience for us. We’ve built two chicken coops and have five happy girls who lay breakfast consistently. Before the coop projects, neither of us had wielded a power tool, framed a building, or poured cement. When the chicks arrived, we learned what they needed as they grew. And then there was the miracle of the first egg, laid right there in our own backyard. The gardens are flourishing – we're growing garlic, potatoes, tomatoes, cucumbers, peas, greens and so much more where seven years ago there was only one small garden bed and lots of potential. Over the years we've added to our fruit orchard – plums, figs, apples, cherries. We started to see connectedness. Not only in our own backyards, but everywhere. So here’s our vision in a nutshell: Nourish our soil, our food, our flowers, ourselves, our families, our neighbourhoods, our earth. 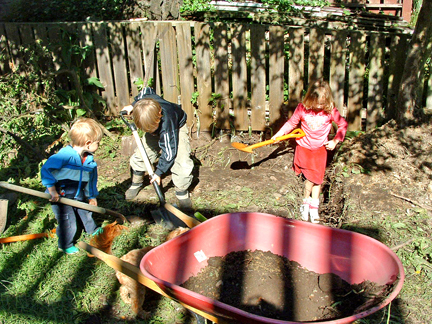 We're looking forward to growing The Backyard Project over the years. We have some ideas, and we're curious about what we don't yet know. What will motivate new aspects of our business over time is what our friends, neighbours, and customers need and whatever delights us.